Technology Trends: AMD's new Bulldozer processors appear at last. But are they any good? AMD's new Bulldozer processors appear at last. But are they any good? We've waited a long time for AMD to release a brand new processor architecture, but finally the AMD FX-8150 has arrived. This first chip is the vanguard of the somewhat tardy Bulldozer technology and is this top-of-the-line AMD FX chip, code-named Zambezi. This is the full-fat, eight-core AMD super-chip running at a not inconsiderable 3.6GHz straight out the box. 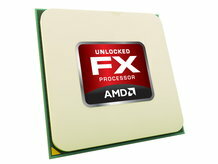 The FX moniker isn't a new one for AMD chips. The last time we saw it used for its high-end parts was in the 90nm Athlon 64 FX-74 in late 2006. It's been reborn this year to cover the first in what AMD hopes will be a long line of Bulldozer-based CPUs. The AMD FX CPUs represent the chip maker's first real new architecture since the exciting times of the first Athlon back in 2003. And it is very much a new architecture; AMD has started from scratch with the design of the Bulldozer modules, taking a very different approach to what makes up a CPU core than anyone else. We'll explore the depths of that architectural change later, but the real key is the use of that word 'module'. Each of these modules holds the essential makeup of a standard dual-core processor, sharing certain non-timing sensitive parts. The AMD FX-8150 has four of these Bulldozer modules and AMD claims that makes it the world's first eight-core desktop chip. It's tough to ignore the sickly sweet scent of fudge here, though this hardware-based solution ought be a lot more effective than Intel's mostly software-oriented HyperThreading. The Bulldozer module represents the future of AMD processors going forward. Speaking with Bernard Seite, an AMD Technical Advisor, last month he told us that the Bulldozer modules are likely to last as the basis for its CPU range for the next 5-7 years. At the moment we've only seen the roadmap for the next couple of years, with the Piledriver update coming next year, Steamroller coming in 2013 and Excavator in 2014. Yes, we know it sounds like a joke, but AMD's latest roadmap really does read like the Urban Dictionary Karma Sutra. But hopes are still high for these new AMD FX processors, especially after it managed to snag the Guiness World Record for highest CPU clockspeed in September. We saw this top CPU here running at well over 8GHz. That is impressive, but realistically it's just numbers. The world record didn't demand the machine to actually run any applications, it just needed to boot into Windows and report it's clockspeed. It also didn't need to be running all its cores. The world record was actually only broken by a single Bulldozer module in operation and under serious liquid helium cooling too. The precedent is there though and means the AMD FX-8150 ought to be one hell of an overclocker's chip. What that will mean in real-world applications though we'll soon see. So how does the new AMD FX CPU stack up then? Can it give Intel's Sandy Bridge a run for its money and can it make AMD a performance chip manufacturer once more?